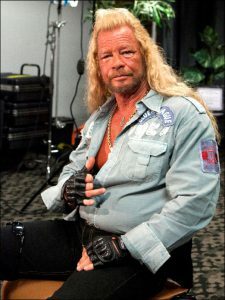 Before becoming the star of his own reality show, Duane “Dog The Bounty Hunter” Chapman lived a rough life. Being raised by an overly strict father led him to rebel during his teens, which got him in serious trouble with the law. Even though he spent time in prison, was addicted to drugs, and had several failed marriages, Dog managed to turn his life around with the help of his fifth wife Beth and because of his devotion to Christianity. The special also chronicles what happened when Dog’s sons, Tucker, sold the infamous tape recording of Dog using racial slurs to the National Enquirer, and Dog watches a video tape message from Tucker, whom he hasn’t seen or spoken to in over three years. E! True Hollywood Story: DOG THE BOUNTY HUNTER premieres May 24 at 10pm EST/PST only on E!